State Sen. Joseph Addabbo has introduced a bill that would require the city to replace all parking spaces taken away by bus-only lanes or any other capital project. This is the second time that Addabbo, who represents areas of central Queens from Maspeth to Rockaway Park, has attempted to pass a version of this bill. 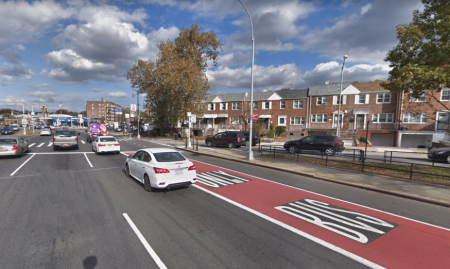 In 2017, after the MTA implemented a bus lane for the 14-mile-long Q52/53 Select Bus Service route along Woodhaven and Cross Bay Boulevards, Addabbo and co-sponsor State Sen. Simcha Felder of Brooklyn introduced a similar bill that eventually died in committee. Simcha is no longer listed as a co-sponsor on the most recent version of the bill. The proposed legislation is aimed at supporting local businesses whose revenue may be affected by customers not being able to easily access their stores. The bill applies to capital projects such as major DOT street redesigns. If passed, the bill would require that all future projects provide replacement parking spaces within a one block radius of the original lost space. “Since small businesses are the heart of the thriving economy of this community, ample parking must be made available,” the bill states. The bill comes as the city is begins to invest even more money into Select Bus Service, most recently announcing a $6.2 million contract to equip 123 new buses with camera systems that will be able to capture cars parking in bus lanes, which will then be ticketed. Mayor Bill de Blasio has been campaigning for increased bus speeds through new bus-only lanes, having police tow cars blocking the lanes, and now the on-board cameras. Addabbo’s bill is now being considered by the Senate’s transportation committee. Make parking so i can get a hot dog from the hot dog truck. State Sen. Joseph Addabbo is correct. On the street parking spaces are a hard to find these days due to a proliferation of car services. This happens all the time when the state/city thinks they are helping but rather are hurting more than helping. For example, Cuomo has manufactured a plastic bag crisis which doesn’t exist. Alternatives offered by Cuomo will harm our environment more than it will help, will make carrying our groceries more difficult, result in destroying our needed forests, and add extra costs as we will either have to pay Cuomo’s regressive tax of a nickel per bag or over a buck for a nice looking shiny so-called reusable bag which will last a month before getting dirty and fall apart. Cuomo will also be destroying a the plastic bag industry upstate, costing New Yorkers 5,000 jobs which no one can afford to lose especially after the 25,000 Amazon disappeared due to the stupidity of Cong. Ocasio-Cortez who acts more like a child than an adult. The upstate plastic bag industry? I’m in favor of bike lanes and pedal assisted electric bikes as a transportation alternative, but the manner in which these lanes were design is not economically feasible.